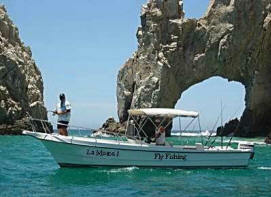 Cabo Fly Fishing and Light Tackle "Yellowfin"
This 24' Super Panga is set up exclusively for Fly Fishing & Light tackle. It is well equipped with Fly fishing Gear, Light Spinning gear & Light conventional gear, outriggers, shade, restroom, live bait tank, fighting chair, large forward casting area, VHF, new technology 4 stroke outboard engine & fast & quiet, this boat will get you to the fish fast without spooking them! 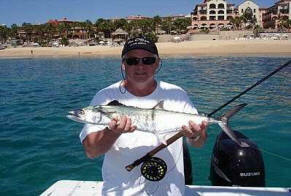 Captain "Roberto" is one of Cabo's top Fly Fishing Captains/Guides with over 15 years experience! Roberto was fly fishing in Cabo before anyone was offering it! Roberto has helped many anglers catch Billfish on the Fly as well as all of the other game fish including Dorado, Tuna, Sierra, Roosters & more! 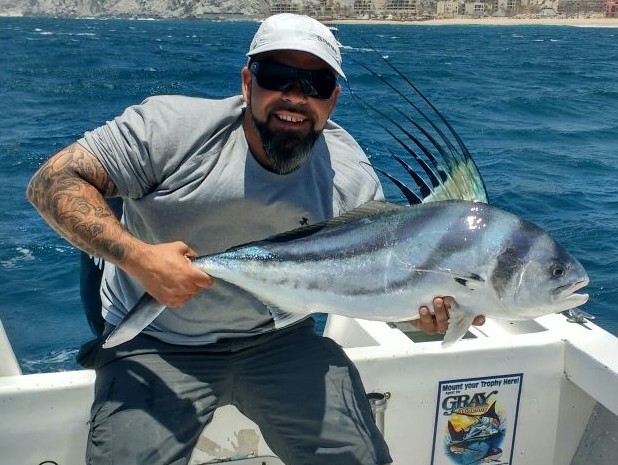 There are not many boats in Cabo with skippers experienced at Fly Fishing & light tackle that speak pretty good English, so book early for a chance to fish on the "Bluefin" with guide "Roberto". Includes: Experienced Cabo Captain/Guide, Fly fishing gear(for rent) 9,10,& 12 wt. light spinning & trolling reels 10,15,20 & 40 pound, wide selection of flys & lures including trolling/casting lures for Marlin, Dorado & Tuna plus smaller lures for Sierra, Skipjack, Tuna, Roosterfish and more. Note- flies used are purchased from $3-$25 depending on the fly, lures are used free & only charged if lost, light tackle use included, & use of Fly rods is $25pp extra, Cpt Roberto makes his own fly fishing leaders at no extra charge. 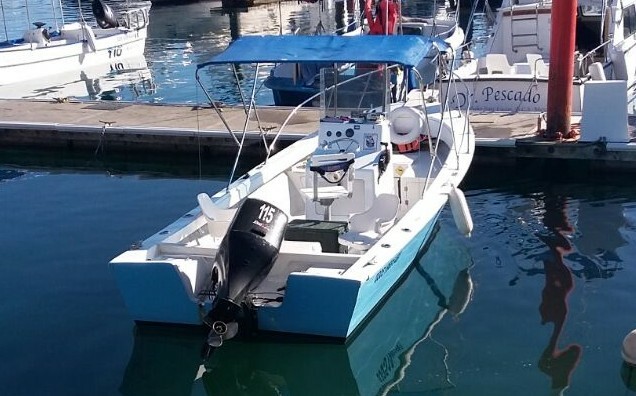 Super Panga, fuel, crew, Light tackle & gear , tax, dispatch fees & dockside bilingual departure/arrival assistance. 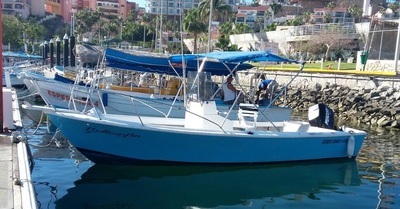 24' Super Panga "Santi" with skipper/guide Victor for $395/day for 7 hours light tackle & $25 extra for flyrod rentals. Single outboard, large open forward casting deck for flyfishing, rear fighting chair for light & conventional gear, live well, GPS, VHF fish finder, restroom, outriggers etc (Victor speaks fluent English). 2 anglers max. Fly Fishing & Light Tackle on 29' Topaz " Ivonne"